Before DOT can stripe a two-way protected bike lane on Chrystie Street, it has to relocate three pedestrian islands to make room for the bikeway. Work on those islands — at Canal, Broome, and Delancey streets — appears to be mostly complete. 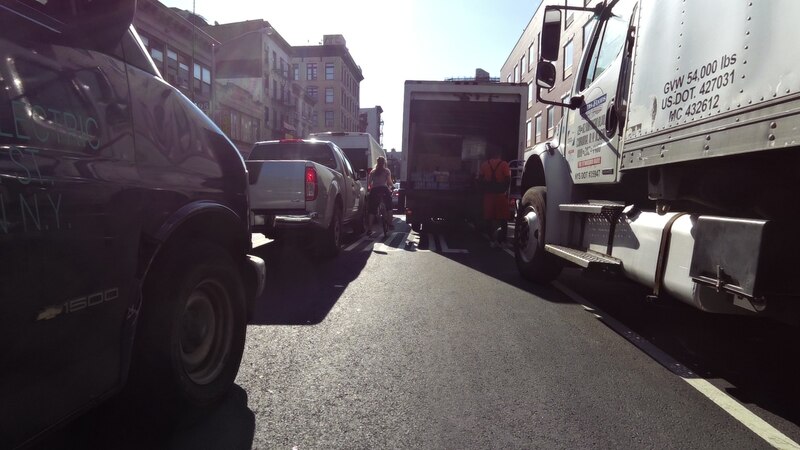 The protected bike lane along the eastern curb of Chrystie will replace today’s un-protected painted lanes, which leave cyclists to mix it up with heavy traffic, including lots of trucks and buses [PDF]. It should significantly improve conditions on Chrystie, which thousands of people use to bike to and from the Manhattan Bridge each day. The existing pedestrian islands along the route have to be shifted over about five feet to accommodate the two-way bikeway. The project also includes new concrete pedestrian islands at East 2nd Street, Rivington Street, and Stanton Street, which have yet to be built. The bikeway could be painted before construction of those islands begins, which is the typical order of work on protected bike lane projects. Markings are cheap. I don’t think this will affect the cost of either the DDC capital project or DOT’s Chrystie Street project to a significant degree. True. Installing markings are cheap. Undoing them seems more labor intensive. May be more expensive. But even if it isn’t…. the ‘markings are cheap’ theory means there shouldn’t be faded lines all over the city, yet… they are omnipresent. One reason is DOT doesn’t bother cleaning the pavement prior to applying the markings. If you paint over dirt, it’s not going to last. A better approach is to have a physically different paving material for bike lanes or crosswalks. Paving bricks or stones works. So does colored concrete. The way road markings are typically removed also makes the pavement a bit rough for cycling. Given the freshly paved tabula rasa here I would hope for better. When this was first proposed they were using the phrase “Safe Routes to Bridges”. Has that been dropped because they’ve decided to do absolutely nothing for the other route to this bridge? Removing the markings makes the road even rougher for inline skaters, the few of us that are left anyway. DOT is striping and painting the new two-way protected bike lane between the Manhattan Bridge and Houston Street.